Disclaimer: I'm not affiliated with Yourkit, but I am grateful for their free licenses for open source projects. I've been using Yourkit for my work on Xtext and Xtend. Improving the performance of an application can be a challenging thing to do. As a developer, you usually have some immediate ideas of what are the performance bottlenecks. However, as Ed said in his presentation at EclipseCon North America 2013, "Don't trust yourself, don't trust your friends, and don't even trust me." I fully approve his message. Why? Experience shows there is truth in this statement. java.lang.System.nanoSeconds(): This simple but useful method gives you access to a decently precise time stamp at any time. You can call this method from your own code and calculate and report the time for what every your desire. But there's a catch: You need to modify the code that you want to inspect, which you sometimes can't do because the code is part of a library/framework or you just don't want to pollute the code. The "lost in the jungle syndrome": The result of a profiling session are a bunch of trees representing all states of the call stack your application had during the profiling session. And just like in a jungle, these trees are incredibly huge. Sometimes the profiler can point out some performance hot spots, but I think that only works well if you have some very obvious performance problems. So you end up spending a lot of time climbing through the trees, considering for every branch whether its existence and time consumption is justified. Observing a system changes it: A profiler usually uses a java agent, which is a hook in the JVM that allows to manipulate class files before they're executed. This way the profiler can inject byte code for performance measurements into the to-be-analyzed classes. 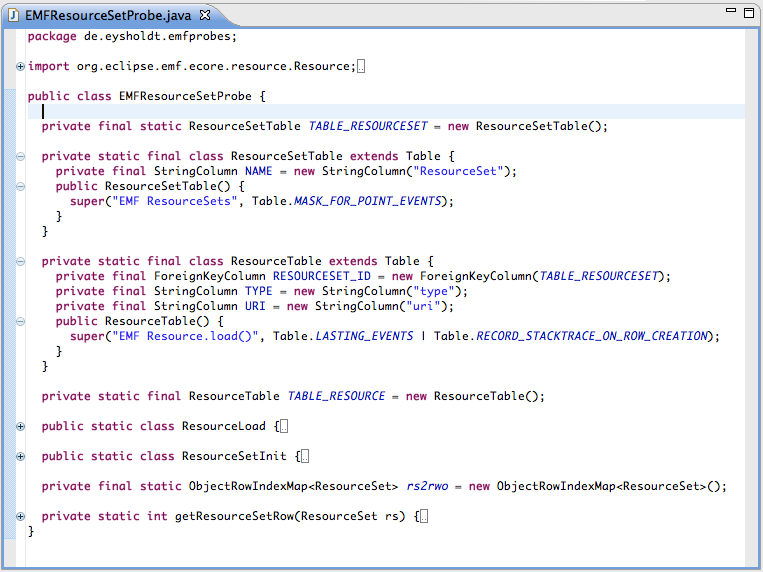 Surely this injected code is small and fast, but it can have an impact on how the Java JIT can optimize the byte code. Example: A method that could be in-lined before may not be in-lined anymore. I don't mind if an application runs slower during a profiling session, but I do mind if the times measured during profiling are disproportional to the actual times. Parameter values are not available: To understand what the code is doing, you sometimes need to know the values of the method parameters. Consider questions such as: Does a certain value occur so often that introducing an early-exit to the method would improve the speed? Does the same value occur because the method was accidentally called from within a loop? Would it help to cache the result of the method? A probe is a Java class that hooks into the invocation of methods of the to-be-analyzed code. Such hooks can be registered to be invoked before or after a method has been invoked. Installing pre-/post-invocation hooks into methods may sounds familiar to you from Aspect Oriented Programming (AOP). It's indeed the same kind of hook, but unlike in AOP you don't need to a special compiler: Yourkit registers the probes at runtime via its Java agent. Therefore, probes don't change your build and are applicable for already compiled libraries. 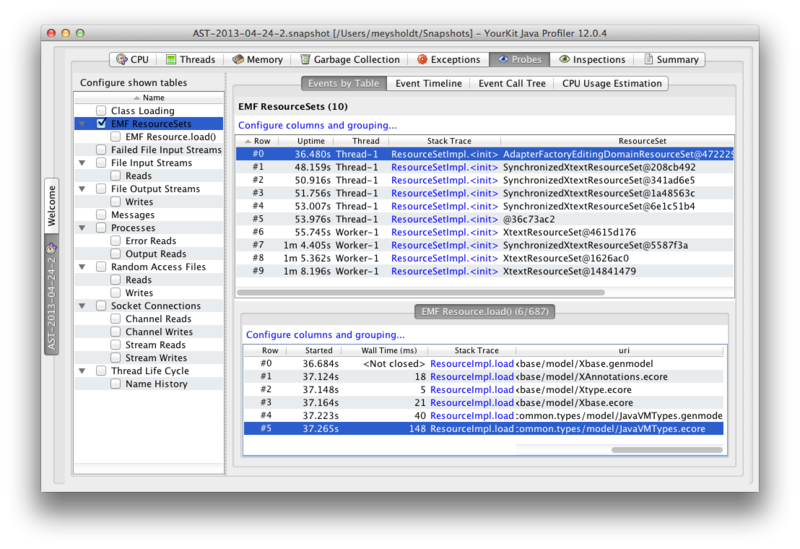 You can use probes independently of CPU profiling (sampling/tracing). A probe is active once it has been registered and you can choose not to enable CPU profiling at the same time. This may safe you from getting the "Observing a system changes it" bias. Yourkit ships with a set of predefined probes for standard events, such as Tread lifecycles, file system I/O, etc. You can as well implement your own probes. In a probe's implementation, you can access the hooked method's parameter- and return values. Youkit encourages you to build a Java data structure for your measured data that resembles a relational data base. If you follow that pattern, Yourkit has a nice graphical user interface to explore your measured data. As an example and for further illustration, I've build a small probe that tracks instantiation of EMF ResourceSets and invocation of EMF Resources. In the terminology of the Eclipse Modeling Framework (EMF) a Resource usually represents a file from the file system. A resource furthermore provides implementations to load a file into memory as an object tree (aka model) or persist a tree back to disk. The *.xtend text-editor shows a file persisted as plain text; It's Resource.load() implementation delegates to an ANTLR parser. The *.genmodel tree-editor shows the structure of a file that is persisted as XML. Here, an XML parser is used. In the tree view on the left hand side you can see all available probes. The probe "EMF ResourceSets" has been developed by me, all others ship with Yourkit. The checkbox does not register/unregister the probe. The checkbox shows/hides the data measured by the probe in the views on the right-hand side of the tree-view. The table on the top on the right-hand side shows a list of all ResourceSets that have been instantiated. The AdapterFactoryEditingDomainResourceSet is the one used by the *.genmodel editor. As you can see, there was more going on in my Eclipse instance before I took the screenshot. A click on the column labeled "stack trace" would reveal how a specific ResourceSet has been instantiated. The table on the bottom right-hand side shows all invocations of Resource.load() for the ResourceSet that is selected in the table above. Here we can see that tracking of application state is possible: The column "uri" displays the file name of the file that has been loaded. The "wall time" is the time in milliseconds that was spent executing the load() method. You can find the full source code of this example here on github. The code that the probe hooks into needs to have the probe implementation on the classpath. Furthermore, it is helpful if the probe has the code it hooks into on the classpath, since otherwise the probe implementation would need to use Java reflection to inspect the to-be-analyzed object. This sounds tricky since it is in fact a cyclic dependency between the probe and the inspected code. 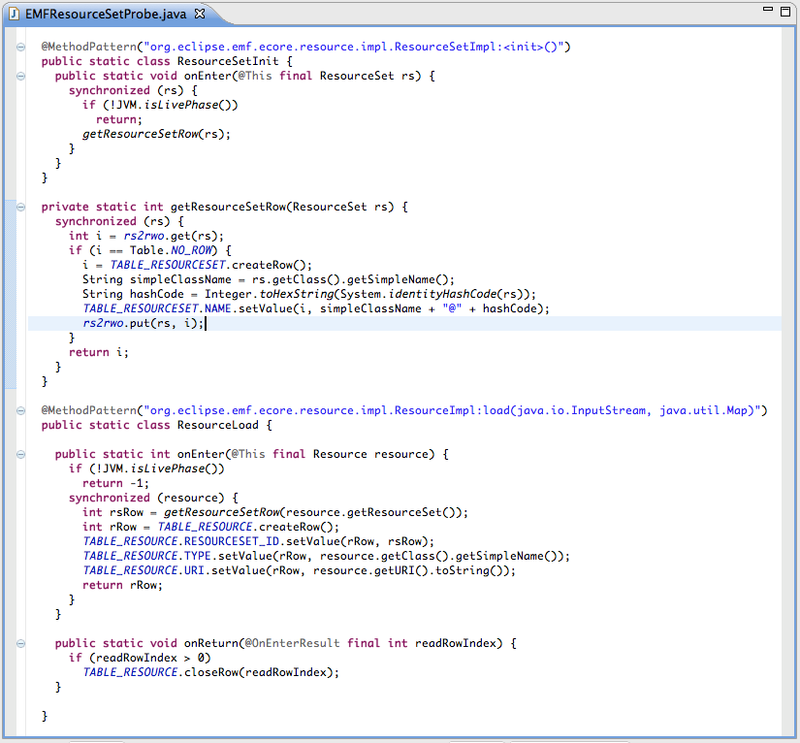 Luckily Eclipse has a simple mechanism to contribute to a plugin's classapth: Fragments. A fragment is a bundle with class files, own dependencies and extension points that at runtime is integrated into the classpath of a chosen host-plugin. We choose org.eclipse.emf.ecore to be that host-plugin. 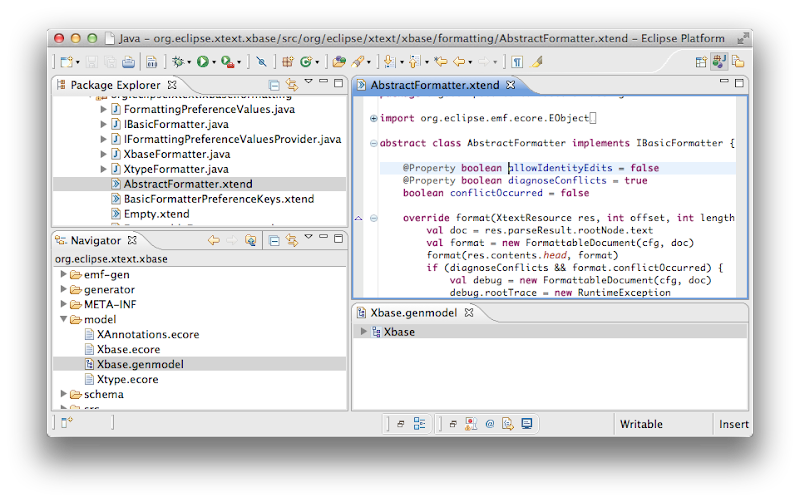 Probes need to be registered: We could do that by changing the JVM's startup arguments, but in an Eclipse environment it seems more convenient to use the extension point org.eclipse.ui.startup. The probe implementation uses Java API provided by Yourkit. This API ca be found in /lib/yjp.jar inside the Yourkit installation. define the data structures for storing the measured values (TABLE_RESOURCESET, TABLE_RESOURCE). intercept calls to ResourceSet constructors (ResourceSetInit) and Resource#load() invocations. map ResourceSet-Objects to Table-Row-IDs (rs2row and getResourceSetRow()). @MethodPattern specifies the signature of the to-be-intercepted method. @This gives access to the object on which the method has been called. @OnEnterResult gives access to the return value of the onEnter method. @Param(1) gives access to the first parameter of the intercepted method. Probes can deliver concise and precise performance measurements for an application or a group of applications that are based on the same frameworks/libraries. Probes have the potential to define reasonable performance metrics for specific applications that can be shared across a team of developers. Probes cause significantly less side-effects compared to general profiling. Probes can make use of more information than a profiler, such as application state, parameter values and return values. Implementing probes is some effort. This may be of less significance when probes can be reused. However, in scenarios were reuse in not intended - for example the explorative search for performance issues - their use may be too much effort.